Do you use different email addresses in your Exchange account? We’ve always been too lazy to manage the amount of administration needed to make different sender addresses in Exchange work. That’s why we developed ChangeSender. With ChangeSender it’s easy to select the sender address from a dropdown box shown in every new email form in Outlook. And for reply’s ChangeSender automatically uses the correct address – the one the original email was received on. Version 3.0 of ChangeSender adds individual sent-items folders, keyboard shortcuts (just hit Ctrl-1, Ctrl-2, etc. 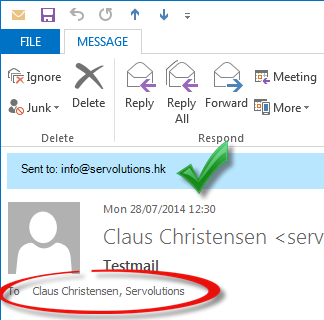 to select your 1st, 2nd, … email address) and automatically switches your email signature to match the selected address and is fully compatible with Outlook 2013. You can find out more on our web site. All current customers of ChangeSender can upgrade to the latest version 3.0 for free.